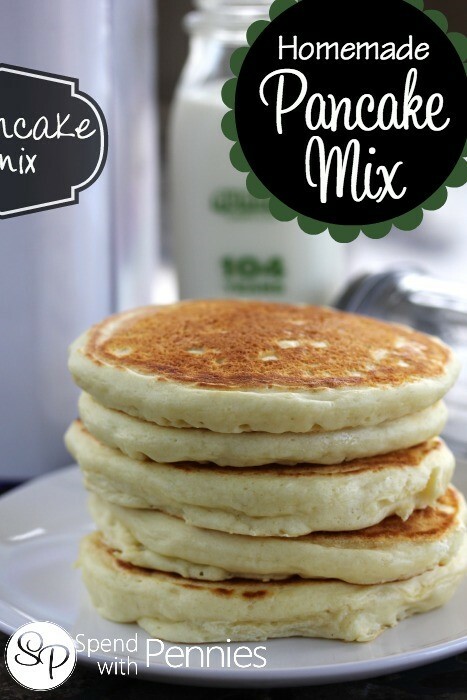 You likely know that you can make your own pancake mix. And yes, pancakes from scratch do taste better than mixes, but when you're in a hurry, and there's no time for scratch, your own pancake mix is the next best thing. So let's look at how to make your own buttermilk or sour cream pancake mix so that you can have great "from scratch" pancakes when you are in a hurry. 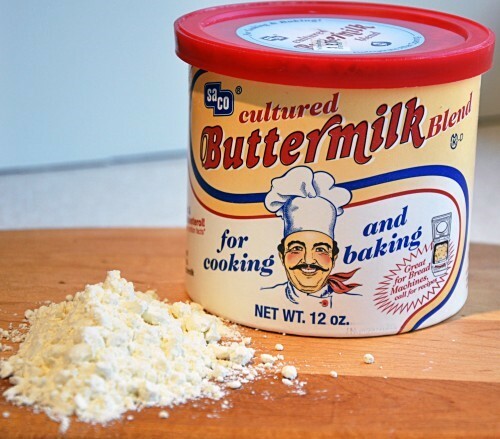 This recipe comes from our friends at Prepared Pantry (www.preparedpantry.com) and has more buttermilk or sour cream than the store mixes, so count on it to taste much better. You can choose to make either a small, medium, or large mix. The ratio of ingredients is the same. Here's the ingredients chart, with amounts organized from small, medium, to large batch. For easier measurement, remember that one tablespoon equals three teaspoons. Combine all the ingredients and whisk together to distribute evenly. Store your pancake mixes in an airtight container in a cool place and it should last a long time (several months). You can buy buttermilk powder in your grocery store or at The Prepared Pantry. 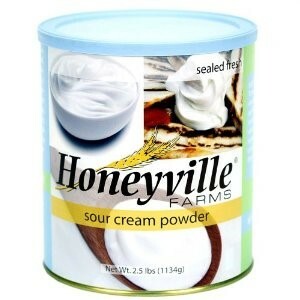 Sour cream powder is more difficult to find but you can purchase it at The Prepared Pantry. Now let's look at what you can do with this delicious and versatile mix. You can add fresh or dried fruit, nuts, or baking chips and end up with a special breakfast everytime. 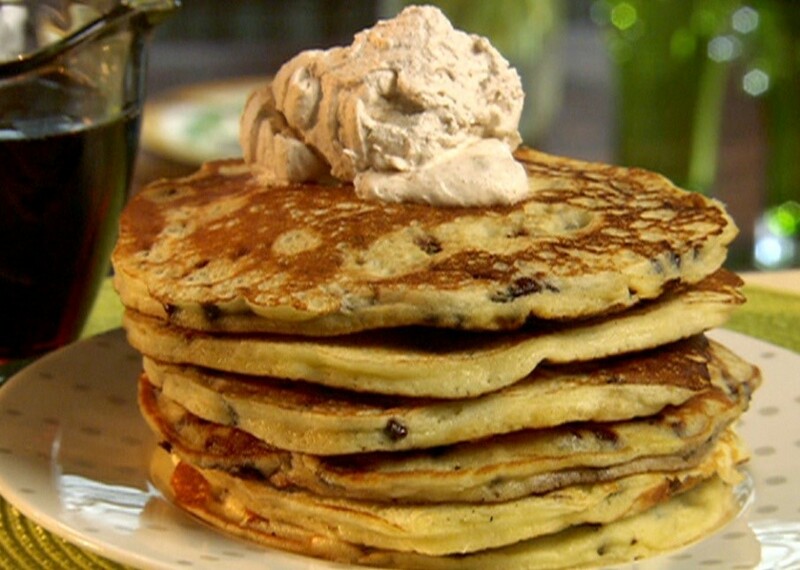 Chocolate Chip Sour Cream/Buttermilk Pancakes (Add mini milk chocolate chips). Serve with maple syrup, coconut cream syrup, or vanilla cream syrup. Cinnamon Chip Sour Cream/Buttermilk Pancakes. (Add mini cinnamon chips). Serve with maple syrup, cinnamon cream syrup, or cinnamon apple syrup. Peanut Butter Chip Sour Cream/Buttermilk Pancakes (Add mini peanut butter chips). Serve with maple syrup or maple cream syrup. Walnut and Date Sour Cream/Buttermilk Pancakes (Add chopped walnuts and dates). Serve with maple syrup, cinnamon cream syrup, or maple cream syrup. Apple Cinnamon Sour Cream/Buttermilk Pancakes (Add grated fresh apples or dry apples plus cinnamon). Serve with maple syrup, cinnamon apple syrup, or maple cream syrup. 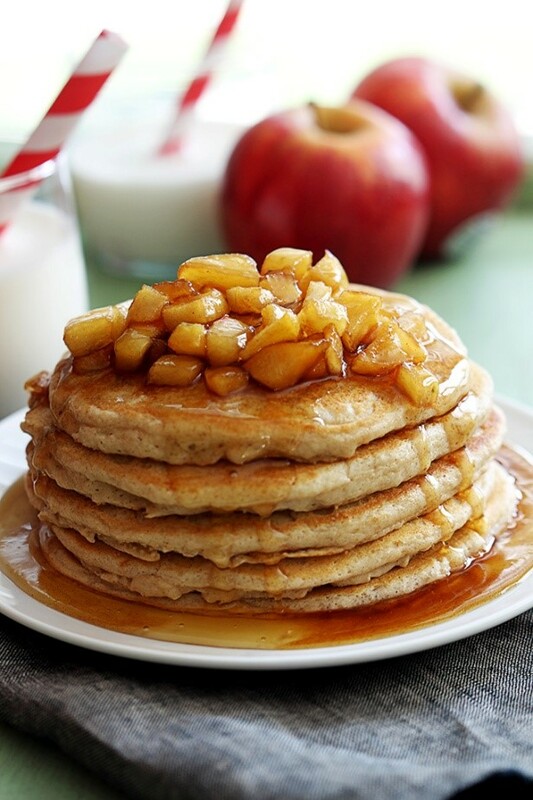 Baked Apple Pancakes (Add grated fresh apples or Fuji dry apples plus maple flavoring). Serve with maple syrup, cinnamon apple syrup, or maple cream syrup. Cranberry Nut Sour Cream/Buttermilk Pancakes (Add chopped walnuts and dry cranberries). Serve with maple syrup, cinnamon apple syrup, or coconut cream syrup. Caramel Pear Sour Cream/Buttermilk Pancakes (Add diced dry pears plus a touch of nutmeg and a little cinnamon). Serve with Cinnamon Cream or Vanilla Cream syrup or a sprinkle of brown sugar. 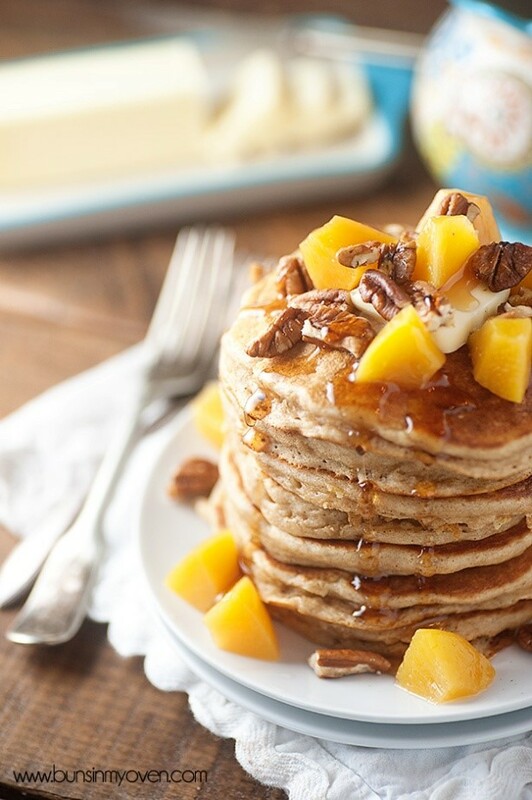 Peach-Pecan Sour Cream/Buttermilk Pancakes (Add chopped fresh peaches and chopped pecans plus a touch of lemon and nutmeg). Serve with Orchard Peach or Vanilla Cream Syrup. Blueberry Sour Cream/Buttermilk Pancakes (Add blueberry baking bits plus a touch of lemon and nutmeg). Serve with blueberry syrup or cinnamon cream syrup. Raspberry Sour Cream/Buttermilk Pancakes (Add dried raspberries plus a touch of lemon). Serve with raspberry syrup. Banana Pecan Sour Cream/Buttermilk Pancakes (Add a mashed banana and a little banana flavoring along with cinnamon and chopped pecans). Top with more sliced bananas. Serve with maple syrup or cinnamon cream syrup. 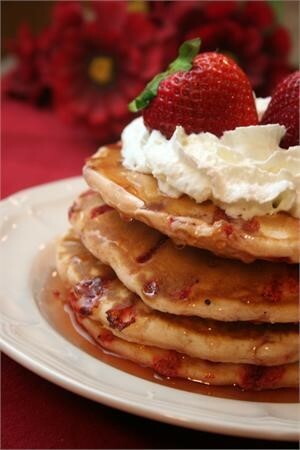 Fresh Strawberry Sour Cream/Buttermilk Pancakes (Add fresh strawberries thinly sliced and a touch of lemon). It's easier to slice your strawberries with a strawberry slicer. Serve with strawberry syrup or vanilla cream syrup. Coconut Banana Sour Cream/Buttermilk Pancakes (Add flaked coconut and mashed bananas). Serve with coconut cream syrup or vanilla cream syrup. Pineapple Sour Cream/Buttermilk Pancakes (Add crushed and drained pineapple). Serve with coconut cream syrup or vanilla cream syrup. Honey Buckwheat Sour Cream/Buttermilk Pancakes (Add a fourth cup buckwheat flour for every cup of flour. Sweeten the pancakes with dry honey instead of sugar). Both dry honey and buckwheat flour is available at the Prepared Pantry. Serve with any syrup. Pineapple Banana Sour Cream/Buttermilk Pancakes (Add granulated pineapple and mashed bananas). Serve with coconut cream syrup or vanilla cream syrup. Sourdough Pancakes (Add sourdough flavor available from The Prepared Pantry). Serve with any syrup. 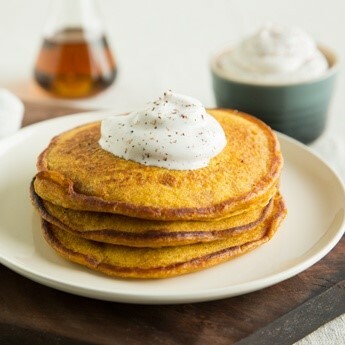 Pumpkin Sour Cream/Buttermilk Pancakes (For each 1 1/2 cups of flour, add 1 teaspoon cinnamon, 1/4 teaspoon nutmeg, 1 tablespoon brown sugar, and 3/4 cup canned or pureed pumpkin). Serve with vanilla cream or cinnamon cream syrup. Strawberry Banana Sour Cream/Buttermilk Pancakes (Add strawberry chips and mashed banana.). Serve with strawberry syrup or vanilla cream syrup. Sometimes all it takes is an unusual flavor ingredient to bring a special sparkle to our everyday pancakes!